Got a reply from MailChimp newsletter support to confirm that indeed plain text editing (see our conversation trail and the full reply below), which used to be a part of the workflow of composing a newsletter is removed. Only 1% of MailChimp users take advantage of the feature. The company I work for AirPair - instant access to world's best developers via pair programming on video chats takes quality control seriously, and always devotes time to editing the plain text edition (some developers may prefer this version, as it is similar and non-cluster like many other news, group, digests and news/releases of development tools they subscribe to). We are "MailChimp 1%"! MailChimp used to have an option allowing editing plain text form of a newsletter. It's the ultimate plain form (possibly the most readable, definitely the most light-weight), the next is probably with images disabled (with the alts displayed), then there's the full multimedia versions, some even with GIF embedded (like General Assembly ones). Thankfully the reply came quickly with a full reply! 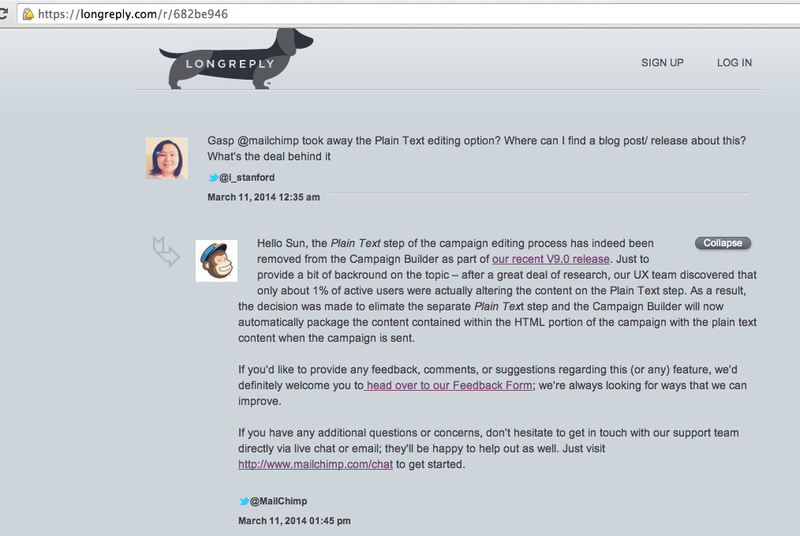 Read the full-length MailChimp support reply regarding plain text editing being removed or see the screenshot below. MailChimp support eased my mind instantly that I am not going insane when discovered that the Plain Text Editing is missing. It turns out to be a deliberate design decision in MailChimp's v9.0 release. Thank you awesome growth boss +Igor Lebovic showing me how to be a +MailChimp super user one step at a time. Of course we are a startup, and our newsletter is not perfect each time, but just proud that we spend a lot of time on quality control, iteration, and really think about testing and deploying newsletters rather than just publishing. Wonderful editing tips. Thanks for sharing. Hey there,MailChimp may be a name you have heard of before and that’s either down to one of two reasons. You have been recommended them via word of mouth, or you have spotted companies using the service they offer. Either way, they can’t be ignored when it comes to a serious email marketing campaign.I recommend for more else information this Email marketing tools in this regard. Thank you.